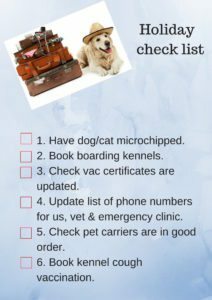 Making a holiday checklist now might sound a bit premature if you’re only going away in December but planning for your pets takes longer than you think. There are some things you simply can’t leave until those final few days before departure. Kennels are usually reserved many months in advance as December is a busy period. Ensure yours are booked now. If you’re using a boarding kennel for the first time, check and double check its references. You’re leaving your precious baby in their hands. Check your pets’ vaccination certificates are up to date. Reputable boarding kennels will insist on updated vaccinations before admitting your pet. This is insurance against contagious diseases which can spread like wildfire in the close confines of a kennel. Don’t forget kennel cough. This is not necessarily a routine annual vaccination but is demanded by kennels. Check your pet carriers. Most of us use our carriers only occasionally and with time their clasps and fasteners may become rusted or worn. 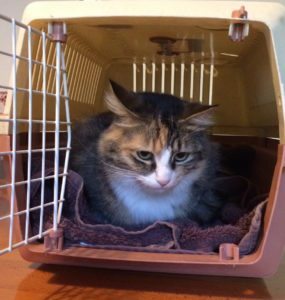 The last thing you want is your pet escaping during transport. Update your contact list for the boarding kennel. This should include how to contact you while you are away or, if you can’t be contacted, then a trusted family member or friend who can make a decision about your pet on your behalf. If your pet falls ill, the kennel will need to make contact to decide on veterinary intervention. Also provide your vet’s details and the contact number for an after hours emergency vet. Does your pet have special dietary needs? Is he/she on medication? List your pets’ special needs or the kennel won’t know to treat them differently from the myriad other animals boarding. Leave the kennel’s telephone number with a trusted family member or friend. You may not make it back in time to pick up your pet and a plan will need to be made.